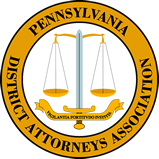 Lindsay Vaughan currently serves as the Executive Director of the PA District Attorneys Association (PDAA) and as the Director of the PA District Attorneys Institute (PDAI). Lindsay has significant state-level policy experience in the field of criminal justice, as well as hands-on experience in the prosecution of criminal offenses. A graduate of Temple University, James E. Beasley School of Law (2007), Lindsay served as a Deputy District Attorney in Bucks County, Pennsylvania for seven years. During her tenure at the Bucks County District Attorney’s Office, Lindsay served as Chief of the Special Victims’ Division for two years, and worked collaboratively with a multidisciplinary team to investigate and prosecute allegations of child abuse. Lindsay served as the lead prosecutor for many sexual assault and child abuse cases. She also prosecuted a wide variety of felony and misdemeanor-level cases, including homicide, robbery, aggravated assault and stalking. In addition, Lindsay was responsible for growing and managing the Youthful Offender Program on behalf of the DA’s office. The program takes a collaborative approach to providing pre-trial diversion opportunities to first time felony offenders between the ages of 18 and 25. Immediately prior to joining PDAA, Lindsay served as Senior Project Manager for the Pennsylvania Commission on Crime and Delinquency (PCCD). In this role, Lindsay worked on multiple statewide projects including work with many other state agencies. Lindsay represented PCCD at weekly Unified Coordination Group (UCG) meetings with over 14 state agencies to develop strategies and policies to combat the opioid epidemic. The UCG was formed when Governor Wolf declared a disaster in January of 2018 in response to the thousands of overdose deaths occurring annually in PA. Lindsay was afforded the opportunity as part of the UCG to represent Pennsylvania at the National Governor’s Association Opioid Data Roundtable in 2018. As Senior Project Manager, Lindsay oversaw the “Naloxone for First Responders Program” in Pennsylvania, which, over the course of a year was responsible for providing more than 60,000 doses of naloxone to first responders resulting in approximately 6,000 overdose reversals. In addition to her opioid-specific work, Lindsay also assisted the PA Department of Human Services and other stakeholders in developing model standards to assist the development and guidance of Multidisciplinary Investigative Teams Commonwealth-wide. Lindsay also played an active role with the School Safety and Security Committee formed in June 2018 to oversee the administration of grant funding as well as develop several tools to assist schools in identifying and addressing safety needs. In this role, Lindsay led a team of experts to develop statewide School Safety and Security Assessment Criteria that serves as a guide for schools to assess their safety needs. Originally from the Blue Ridge Mountains of Virginia, Lindsay currently lives in Harrisburg, PA and enjoys spending time on the Appalachian Trail. Greg Rowe is the Director of Legislation and Policy for the Pennsylvania District Attorneys Association. Greg has extensive criminal justice and public safety experience on the local, state and federal level. Most recently, Greg was the Chief of the Legislation and Policy Unit in the Philadelphia District Attorney’s Office and, in that capacity, served as the legislative liaison for the PDAA. Greg has been extensively involved in many important legislative initiatives, including enactment of Pennsylvania’s strangulation law and reforms to the Wiretap Law. Prior to that, Greg served as Governor Rendell’s Senior Policy Manager for Public Safety and as Special Assistant for Criminal Justice. In these positions, Greg oversaw Pennsylvania's public safety functions with regard to policy, legislation and operations and was the Governor's day-to-day contact for Pennsylvania's State Police, Department of Corrections, Board of Probation and Parole, and Commission on Crime and Delinquency. Greg also practiced commercial litigation for several years and began his legal career in the Appeals Unit of the Philadelphia District Attorney’s Office. Greg has worked with the National Governors Association, the Council of State Governments, and the PEW Center on the States to help officials from other states learn about successful strategies to reduce recidivism. Greg was also selected as a participant in the Kennedy School of Government's Executive Session for State Court Leaders in the 21st Century. As part of the Executive Session, Greg authored a paper entitled “Keeping Courts Funded: Recommendations on How Courts Can Avoid the Budget Axe,” which was published by the National Center for State Courts. Before attending law school, Greg was a research assistant to the late Senator Daniel Patrick Moynihan and helped coordinate public safety issues for the Senator. Greg holds a J.D. from the University of Wisconsin, and an A.B. from Harvard College. Greg lives in Philadelphia with his wife and their daughter. Greg can be reached at 717.347.8369 or growe@pdaa.org. Allison J. Hrestak currently serves as the membership services manager for the PA District Attorneys Association (PDAA), and as the training manager for the PA District Attorneys Institute (PDAI). She is responsible for organizing and developing the PDAA's statewide conferences and the PDAI's statewide training events including: curriculum development, negotiation of contracts, marketing of courses and overseeing the compliance with all requirements of the Continuing Legal Education (CLE) Board. Ms. Hrestak also serves as the liaison representing the PDAI in training grant related projects, such as the Child Abuse Coalition, Juvenile Prosecutors Network, State Correctional Institution Crimes Prosecutors Network and the Education and Training subcommittee. Hrestak most recently served as the Press Secretary in the Department of State's Office of Communications and Press for the Ridge/Schweiker and Rendell Administration's. She also served as a Deputy Press Secretary for the Department of State as well as a Press Aide in Governor Tom Ridge's Office of Communications and Press. She is a 1999 graduate of the Pennsylvania State University, where she earned a bachelor's degree in Communications. On August 22, 1994 Patty began her tenure at PDAA/PDAI as a part-time Program Clerk assembling training manuals and serving as back-up Receptionist. She was gradually given more duties assisting the accountant with payables and receivables and eventually, with the creation of the new Appellate Coordinator position, was offered full-time employment so that she could add Secretary to her job duties. As PDAI continued to grow and was awarded new grants, the need for a Grants Manager was deemed necessary. Patty was promoted to that position in March of 2001. In addition to her accounting duties, other job duties involve assisting in budget preparation, submission of all grant applications, and quarterly reports. Támara is the Training and Membership Services Coordinator for PDAA and PDAI. Some of her many duties include; membership renewal, customer service, information distribution, course registration, document production, and graphic design for many PDAA/PDAI publications. Támara has a Bachelor of Music Degree (emphasis in recording technology) from Lebanon Valley College and an Associate in Theater Arts Degree from Harrisburg Area Community College. Outside of PDAA, Tamara is the Resident Sound Designer for HACC Theaterworks productions and is the Historian on the Executive Committee of the Sons of Italy Lodge 2651. As staff accountant Elena Hostetter is responsible for the completion of the accounting and financial reporting and coordinates the internal compliance audits. Additionally, Elena oversees the employee benefit plans. Throughout the past 20 years Elena has gained extensive experience in the accounting/controller environment within the construction and mechanical service business.